3)Laser cut,3D products, chenille, Applique, Cushion, special embroidery skills etc. 5)Also available in uniform patches, aviation patches, flag patches, military patches, unit patches, sew on patches, iron on patches, sleeve patches, policy patches, girl and boy scout patches, Logo patches, club patches, school patches, costume made patches. Technique	laser-cut	3D products, chenille, Applique , Cushion, pecial embroidery skills, Laser cut, hand-cut, merrowed etc. 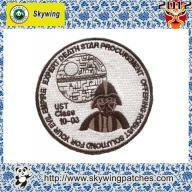 Product Type	patch	uniform patch, aviation patch, flag patch, unit patch, military patch, sew on patch, iron on patch, sleeve patch, policy patch, badge, patch,girl and boy scout patch, logo patch, club patch, custom made patch, soccer patch,security patch, school patch and baseball patch etc. Our company is specialized exporter, manufacturer and supplier of military badges in china.